Dennis Hogan, left, announced his intention to run for Hillsborough County Attorney in the November election, while on the air at WSMN radio June 3. Republican Dennis Hogan has announced his intention to run for Hillsborough County Attorney in the November election. Hogan, of Nashua, served as county attorney from 2011-2012. He lost his bid for reelection in 2012 to Democrat Patricia LaFrance. Hogan says while serving as county attorney he cut spending in the department by 8 percent. Under LaFrance, Hogan says spending has increased by 2 percent, a point which LaFrance countered shortly after hearing about Hogan’s intention to run again. Hogan has handled criminal defense, bankruptcy and personal injuries since beginning the private practice of law in 2002. Hogan established his own firm in 2005. Hogan served as Ward 2 Delegate to NH’s 17th and last Constitutional Convention in 1984. He represented Ward 2 in the NH Legislature after the 1984 election. 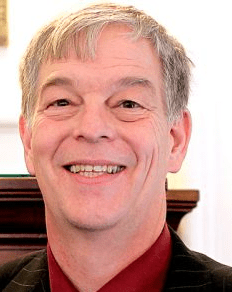 He served in 2005 on the Nashua Board of Education, and in 2006, Hogan prevented “Cop Killer Advocate” Tom Alciere from becoming the Republican nominee for State Senate District 13 by mounting a successful write-in campaign for which he received 89 percent of the vote. 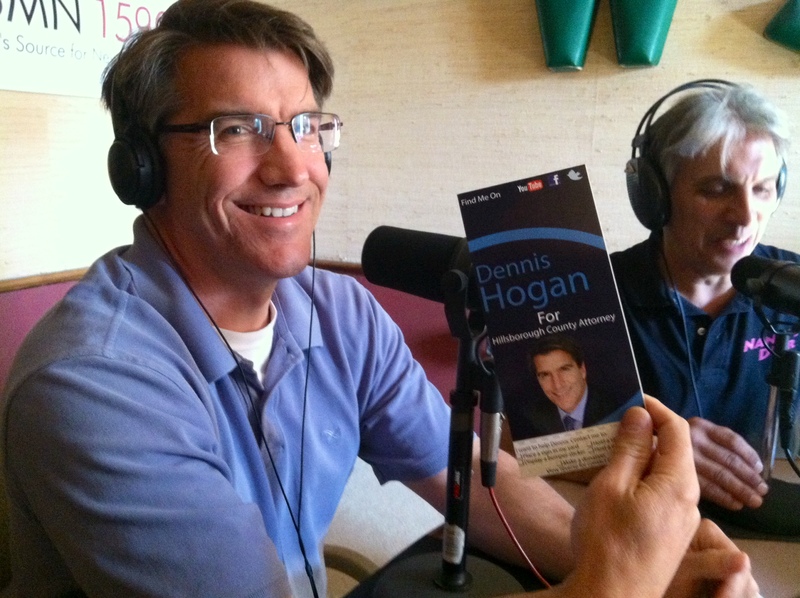 You can learn more about Hogan’s campaign at hoganforcountyattorney. The filing period for candidates running in the November 2014 election begins June 4. 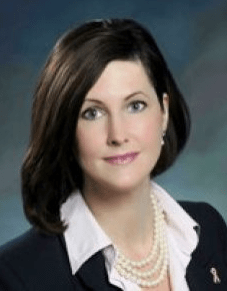 Why is Diane Sheehan running for Executive Council? It’s a rail thing, something you might not understand fully unless you’ve been following along with current Executive Councilor Deb Pignatelli, a strong proponent for bringing commuter rail to Nashua and beyond. Diane Sheehan, a Democrat, will announce her candidacy for District 5 Executive Councilor. Sheehan will throw her hat into the ring officially when the candidate filing period opens June 4. Pignatelli recently announced she would not seek reelection for Executive Council, citing some minor health issues. Sheehan, who currently serves as an Alderman At Large for Nashua, says she is ready to represent District 5. “I was very surprised with Deb’s announcement not to run, and was approached by people who were concerned with what would happen when the rail study is completed in the fall. In the interest of what happened the last time we had someone who was unresponsive in that seat, I feel it’s important that we have someone who understands the economic opportunity rail presents and is ready to act on it, should that be what the study supports,” Sheehan said. Sheehan was referring to former Executive Councilor David Wheeler, who lost his seat to Pignatelli in 2012. Months before the election that year Wheeler faced down some pro-rail constituents during a public meeting in Nashua, where support for a commuter line is strong. David Wheeler will seek to regain his Executive Council seat in District 5 in the November 2014 General Election. Wheeler, a Republican from Milford, said over the weekend he has every intention of running again to regain his Executive Council seat, a decision he came to long before Pignatelli announced she would not seek reelection. He also hasn’t changed his mind about the impracticality of bringing commuter rail to Nashua. “It’s not that rail isn’t a good idea; the question is how do we pay for a project that will cost half a billion dollars, with interest?” said Wheeler. “And then it’s going to have to be subsidized by New Hampshire taxpayers at about $10 million a year. Meanwhile, Nashua has the honor of having one of the only public transportation systems operating in the black, the Boston Express. If you pull people off the bus and put them on a train, not only will the bus be in the red, but the train will, too. It’s something we need to give careful consideration to,” Wheeler said. Sheehan, who recently switched her party affiliation from undeclared to Democrat for this election, said she is primarily running to make sure voters have an alternative to Wheeler. She says winning the Executive Council seat would not limit her ability to serve Nashua in her role as alderman. “I’m confident that a lot of what I’m doing on the Board of Aldermen, including work with the Nashua Regional Planning Commission, will result in some good sharing of information. Rail is a key issue for people living in Nashua. I don’t want to see it stall out again,” Sheehan said. Wheeler said he is interested to learn the results of the rail study, but will find it difficult to get past the lack of dedicated funding to move the idea forward, should the study support that. And besides that, he’d be surprised if the study supports bringing rail into Nashua. Sheehan says Wheeler’s resistance to the study, despite support from many constituents in Nashua – including Mayor Donnalee Lozeau, Chamber of Commerce President Christopher Williams and several sitting aldermen – simply underscores how out of touch he is with those he was elected to serve. “[Wheeler] delayed rail for two years, and many were happy about that. But many, many, many more were not. He wasn’t even delaying rail, he was delaying having good information with which to make a good decision about rail,” Sheehan said. Wheeler stands by his position. The field for Pignatelli’s seat is getting crowded, as Republicans Steve Stepanek, of Amherst and Steve Hattmer of Hollis have both announced their intentions to run, as well as Democrat Jennifer Daler of Temple. Like this one, a recap of a recent day trip I took from New Hampshire to New York City and back. I’m simply reposting the short chain of events directly from my Facebook page. Although it may read at first like any other self-involved series of Facebook posts, I urge you to read through to where the magic of Facebook takes over, at about 11 p.m.
For me, it’s a powerful lesson on the intrinsic value of “following” the adventures of others online – even people we’ve never actually met. The connectivity we have at our finger tips, and the happy endings that connectivity sometimes leads to, is what this techno-life is all about. And special thanks, again, to Michael Reed, for being there. Impromptu trip to NYC to deliver James Neil’s big suitcase … so he can move back to the U.S. with most of his stuff. Travel time: 14 hours round trip via bus and train. Son time: 5.2 hours. Long day but fun adventure. 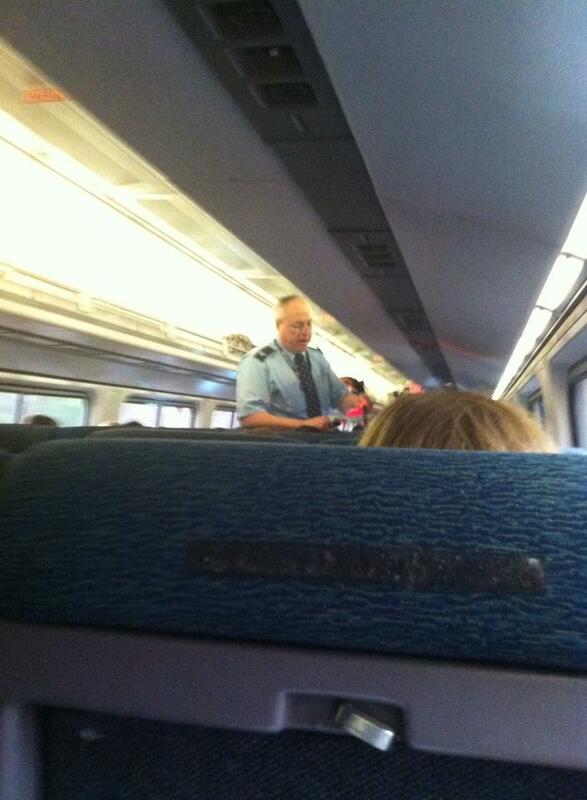 Today I celebrate #Amtrak and this guy, the wry conductor pretending to hate his job, but really making me feel great about this ride when he rallies with a “So far, so good,” after my “Good morning,” volley. He efficiently scanned my eTicket with a gadget 10 minutes after departure. I didn’t have to stand in line, or take off my shoes. There is enough leg room for a team of horses. I have an electrical outlet next to my seat, and wifi. I carried my coffee and breakfast sandwich on and am lingering over it as we roll past woods full of resurrecting trees and meadows, a puddled ball field and bridge graffiti. I have time to think and breath and fill out my NH Employment weekly claim form. I have time to consider that life is always about the journey, staying connected, having enough gas to go the extra mile, and above all, squeezing as much goodness out of every day, no excuses. April 30, 2014 7 p.m. (Posted shortly after boarding the Amtrak at Penn Station in NYC, one hour later than scheduled, bound for Boston). Whirlwind NYC adventure over. James Neil looked so young and handsome and was a good navigator. My umbrella didn’t make it a block out of Penn Station, but thanks to Lauren Goglick for the spare. Train home is one hour behind schedule but I should make the last bus home. — with James Neil. Do I know anyone who is in Boston right now heading for NH? 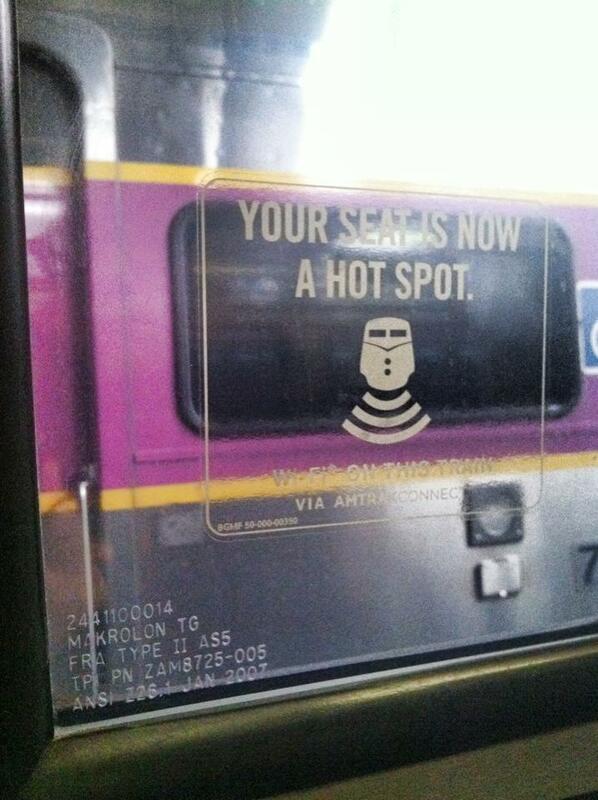 I am about to miss the last bus out of South Station. Michael Reed Carol, I am landing in Logan in about an hour. Inbox me if you still need a ride. Nikki Arguin I can come pick you up if you need a ride? Carol Robidoux Aw Nikki thanks. I think I am going to try and find Michael at Logan. And Marie, I know you would!! Janine Iamunno Obviously we need to know that you made it home okay! Suzanne Blanchard Hope you’re home safe! Carol Robidoux And the hero of our story is Michael Reed, who swooped in from Philadelphia, via Atlanta, and found me like a forgotten bag on the carousel of hopelessness in Terminal B at Logan Airport, where I managed to arrive after crying over spilt milk and other unidentifiable remnants of the day at a table of homeless guys hunkered down in the South Station concourse. I learned that although I missed the last bus to NH, there was still one more bus, the Silver Line, to Logan. I hopped it like a lovestruck bunny and got off at the first stop. Not knowing the details of Michael’s flight, I wandered the terminal on foot, looking for one comprehensive “arrivals” sign board to find any arriving flights from Philly. After about 30 minutes of terminal purgatory, Michael texted to say he was heading to US Air baggage claim. I hoofed it from Terminal C to Terminal B, and flagged down a young man with a name badge to point me in the right direction. He pushed me out the sliding doors and said, “Try the arrival terminal.” Minutes later, Michael was there and graciously offered to drive me all the way to Londonderry to get my car, even though he only had to go to Nashua. He said it was his anniversary, and if his wife were in a similar predicament, he’d hope that someone would show her the same kindness. My day ended on that feel-good note, 21 hours later, and in all, I’d say it was a fine ending to a great adventure. Carol Robidoux OH, and the BIG PS is that Michael and I have never met in person, that I can recall. But we met through my job at Nashua Patch. Michael, a frequent flyer for his work, contributed some blogs on his experience at various airports, with tips and advice. We became FB friends sometime after that, and if not for my virtual SOS I’d have spent the night searching the terminal trashcans for a midnight snack with my homeless guy compadres. Judy Blachek A fantastic Facebook story! Rosemarie Rung Carol, the goodness of people always comes through, even when you cross the line into despair! LOVE THAT MICHAEL REED!!! Diane Sheehan Phew, glad I accepted his friend request! Haha. Lee Guerette Wonderful – the absolute provides — absolutely ! Bridget Gavaghan Everman FB to the rescue! What a great story! Thanks, Michael for taking care of Cousin Carol! Jean McBryar Don’t worry Michael Reed, Carol Robidoux loves it when someone talks her ear off! Nikki Arguin Glad you made it home safely! Carol Robidoux Nikki, thanks again for your generous offer. Nashuans are amazing! Debbie Boland great story Carol. It is your good Karma at work !!!! Linda Masten So happy that you made it home safely! I also am smiling while reading your story. Your fantastic way of writing keeps us all enchanted. Your next title in life should be author! Pat Grossmith Thank you, Michael Reed, for rescuing a wonderful, kind and giving friend. Four dozen of New Hampshire’s top law officers, health officials and addiction experts came together to share their first-hand frustrations and observations about the fallout from the current drug epidemic responsible for unprecedented accidental deaths, spiking crime rates and a revolving door of addiction here, and across the country. U.S. Sen. Kelly Ayotte, R-NH, organized the two-hour listening session on April 23, a group which included: NH Attorney General Joseph Foster; police chiefs from more than a dozen cities and towns, including Manchester Chief David Mara and Nashua Chief John Seusing; Chief Medical Examiner Dr. Thomas Andrew; Dr. Cheryl Wilkie, of Easter Seals/Farnum Center; and others. 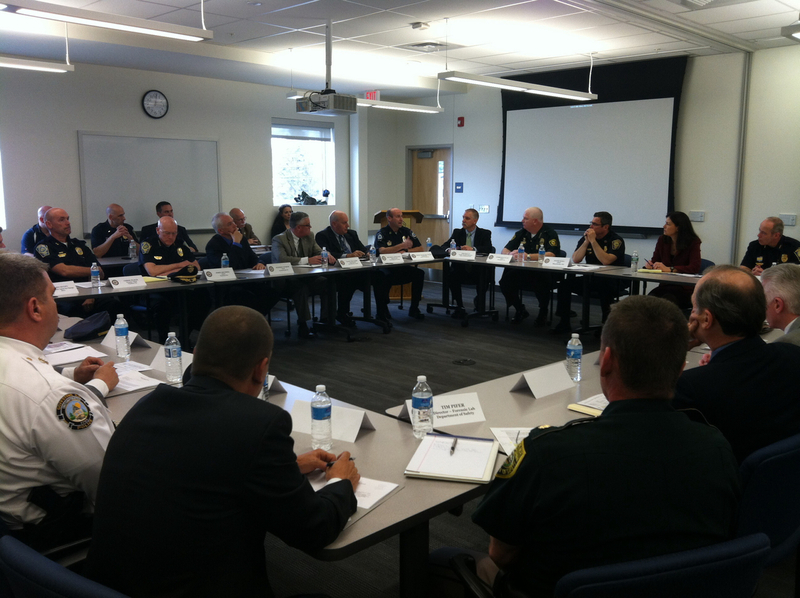 U.S. Sen. Kelly Ayotte, R-NH, listens to discussion by top NH officials on heroin/oxy addiction. The only thing missing from the gathering was the kind of politicized posturing one might expect from a meeting of the minds involving state officials and federal officials. Instead, the panelists spoke with a genuine sense of urgency about the alarming prevalence of heroin and opiate use, which has rapidly become an epic public health problem here. 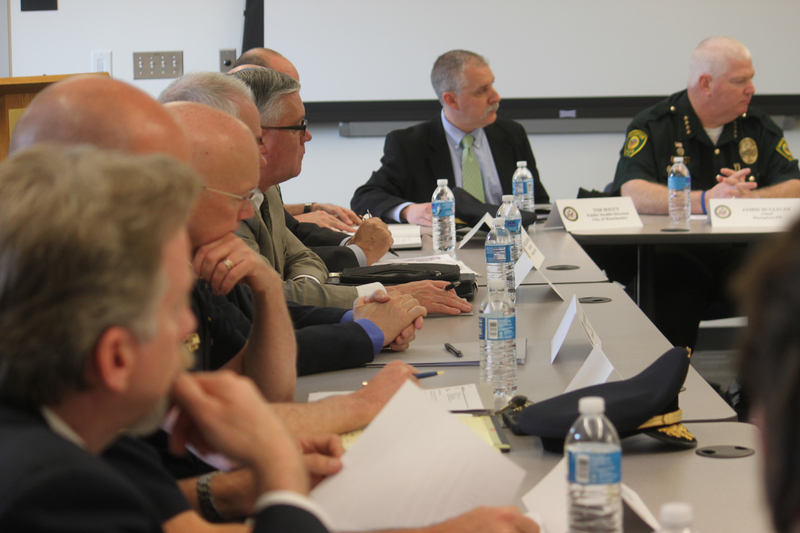 NH top law and health officials talk about the current drug crisis in New Hampshire. Jails are jammed, with no in-house rehabilitation; state-funded beds at treatment centers have wait lists at least two months out. Crime victims have no assurance that their communities are safe from drug-driven criminals. Families are desperate for answers. From left, NH Attorney General Joseph Foster, Dover Police Chief Anthony Colarusso Jr., Michael Forti of NH Drug Task Force and Jay Fallon of New England High Intensity Drug Trafficking Area. 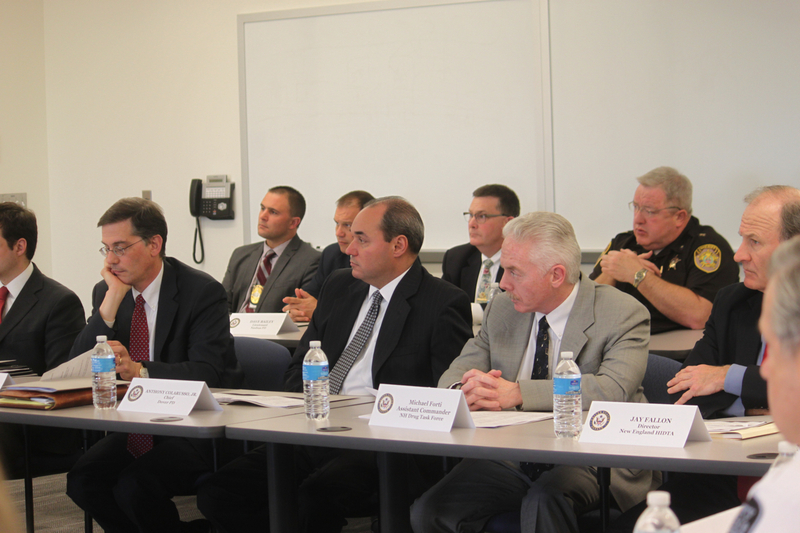 You can watch all seven parts of the Heroin/Opioid Roundtable below. Just click play. Manchester Police Chief David Mara talks about the progression of heroin addiction for the typical user – often escalating from oxycodone use. But with a street cost of $30 for a 30 milligram pill, multiplied by a several pill-a-day habit, addicts turn to crime to support their addiction. In the first quarter of 2014: 600 grams of heroin were confiscated so far, on track to quadruple what was confiscated in 2013. New Hampshire Chief Medical Examiner Dr. Thomas Andrew said annual drug deaths have increased from about 50 to nearly 200 in the past decade. Of the 193 drug-related deaths in 2013, all but two were ruled accidental, pointing out an unintended consequence of drug addiction. 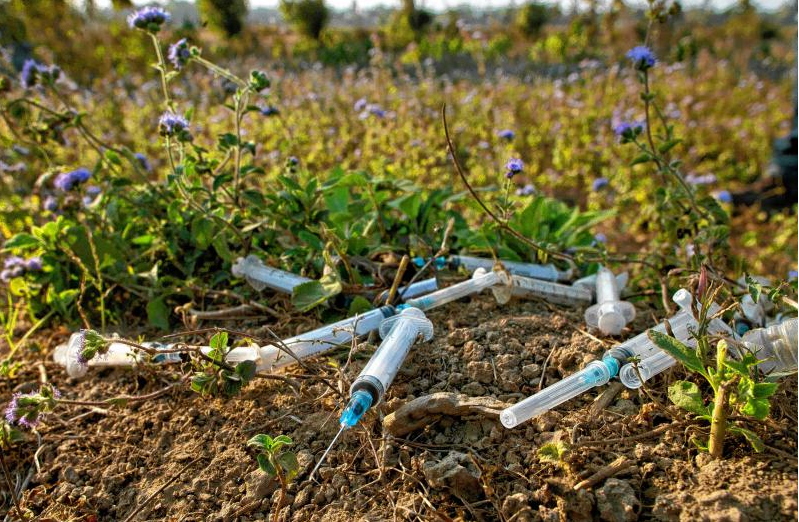 Purity and price are the driving factors pushing heroin to the top of the chart of most-deadly drug. NH Attorney General Joseph Foster said heroin and prescription drugs are a problem in every jurisdiction across the state. “It has no boundaries. When I meet with Attorneys General from around the country, I hear the same thing,” Foster said. He relayed getting a prescription for 30 pain killers after minor knee surgery. He has asked the NH legislature to add another drug prosecutor to his team, and will press for more treatment options. He said he’s also working to put more Narcan, an opiate blocker, into the hands of police and medical personnel. Dr. Cheryl Wilkie, Senior Vice President of Substance Abuse Services for the Farnum Center in Manchester, said New Hampshire is heading “in the right direction.” Wilkie would like to see jails and prisons include treatment for addicts, once incarcerated. “They are a captive audience, and we’re already paying $30,000 for them to be there,” Wilkie said. Kensington Police Chief Michael Sielicki said police see no short- or long-term solution. “There’s nothing we can do but arrest them and hope they sober up and stop breaking into houses,” Sielicki said. He is calling for a top-down approach to solving this problem. “There has to be a more comprehensive approach. There has to be leadership from the top to focus all our efforts in fighting this,” Sielicki said. Enfield NH Police Chief Richard Crate said it’s time to call on the medical community to stop over-prescribing oxy medications. Medical Examiner, Dr. Thomas Andrew, said for every death from drugs in New Hampshire there are 26 people seeking treatment; over 100 habitual users; and 675 who are at some point in the pipeline to addiction. “The death piece is the tip of the iceberg. The bang for the buck is in treatment, not on my side,” Andrew said. Andrew also talked about the call to boycott Zohydro, a controversial new time-release opiate that has recently received FDA approval, and which some experts say will only increase the problem of opiate addiction. Nashua NH Police Chief John Seusing said “the majority of crimes investigated” by police across New Hampshire are either directly or indirectly related to this drug. Over the past four years the number of heroin-related arrests in Nashua have increased six fold, and the number of overdoses are on track to triple this year over 2013 overdose statistics. Seusing said his primary focus is to get drug dealers off the street. But it’s equally important to focus on treatment, otherwise addicts and dealers end up right back on the street. Based on the need in Nashua, Seusing is preparing to request an increase in funding from the Board of Aldermen to hire more police officers. “My drug unit has told me there is too much work on the street for them to handle,” Seusing said. Portsmouth NH Police Chief Stephen Dubois said based on what he’s heard from his peers, things worked better when there were more federal funding sources available to fight the crack problem of the 1980s and early 1990s. 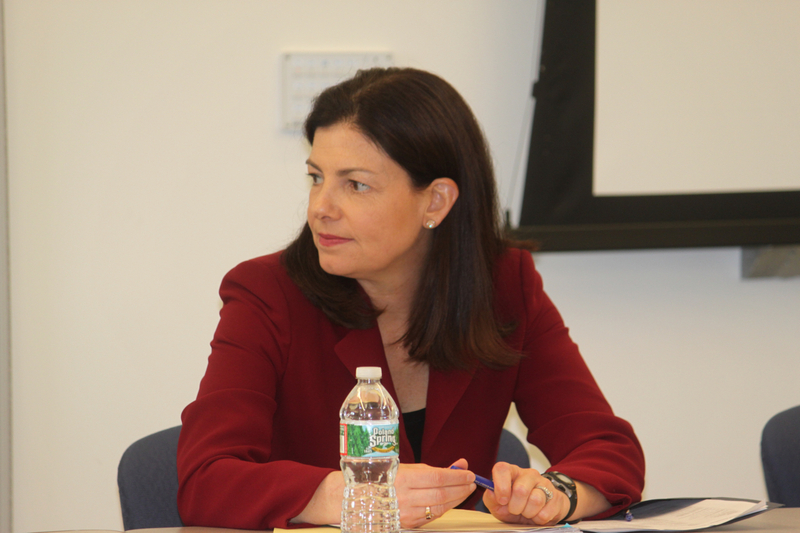 Sen. Kelly Ayotte, R-NH, said there are things that can be done from a federal level to help state and local law enforcement. “I know there are always challenging budget times – but I think this is a priority for people. What I’m hearing from my colleagues, is that this isn’t a Republican or Democrat issue; this is just basic for everyone, in terms of public safety and quality of life,” Ayotte said. Hampton NH Police Chief Jamie Sullivan said he’d like to hear more about holding drug companies accountable. “What can we do to address the extreme profit motive these pharmaceuticals have to put these pills out there?” Sullivan asked. He said he’d like to engage drug companies in providing more education and treatment. Enfield NH Police Chief Richard Crate said federal programs like Operation Streetsweeper may have been effective for the crack epidemic, but in small towns, treatment options are what’s needed most. “I have housewives and moms burglarizing other homes for pills … I don’t need more officers, I need more help with treatment centers available to rural communities, so when we arrest them we have a place to send them so it stops,” Crate said. Dr. Cheryl Wilkie said the heroin epidemic is different from other drug problems. “I don’t think we’re going to see this changing back to cocaine or any other drug. The way heroin hits the system, the addiction is so powerful, and coming off of it is so different from coming off cocaine. With heroin, you are so sick you will do whatever it takes to get the drug, which is why we’re seeing housewives, and all the different people , who will do anything. It’s the only thing that stops them from being sick. That addiction doesn’t just disappear. This is going to be the drug of choice, and once they try this they will not spend another dime on alcohol or cocaine or anything else,” Wilkie said. Derry NH Police Chief Ed Garone said he was frustrated, and sensed frustration of others in the room. “Law enforcement has to do something about the symbiotic relationship between supply and demand, and law enforcement has the ability to affect one side of it – and that’s the supply side, and we do that by arresting,” Garone said. “Once arrested, they have to be incarcerated and when they are incarcerated they need treatment. It’s the perfect opportunity to provide treatment. I’ve been told you can spend however long in prison as an addict, and when you come out, you’re still an addict and that is a problem,” he said. Garone also said there are too many victims. “We can’t arrest our way out of it, but we have to stop saying it costs too much to incarcerate. We can’t wait to educate 7th or 8th graders so by time they’re 17 or 18 or 19 they are not breaking into homes; we have to do something now,” Garone said. Manchester Public Health Director Tim Soucy said he was heartened to hear so many law enforcement officials talk about treatment. Getting to kids earlier will help. But for now, quality of life issues persist. 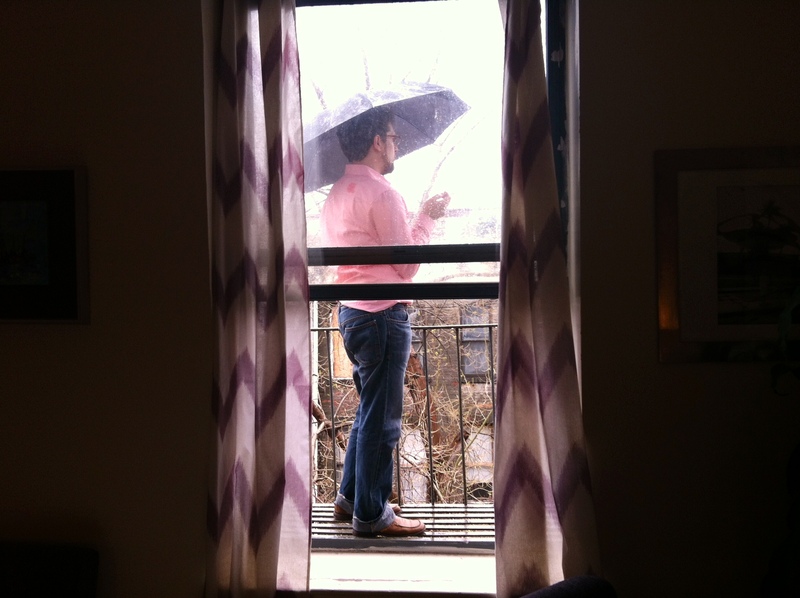 “Not a day goes by where my office doesn’t get called to go pick up used needles in the city. We’re finding them everywhere – street corners, people’s driveways, alleys, woods – and I’m concerned with the long-range implication of this continued needle use that we’ll see more Hep C and HIV,” Soucy said. These drugs are coming primarily from South America and Afghanistan. Dr. Thomas Andrew made the point that someone needs to cultivate better collaboration across state borders to stop the drugs from coming in. “The corridors from which these [drugs] are distributed are 91 and 95. If we look at a Zip Code analysis, there’s a wide swath between Keene and the Seacoast; the Lakes Region and North Country; and the border and south. Is it a federal responsibility to enhance interdiction efforts and distribution? We’re not even hassling the end users, at the distribution level, and I think this is federal responsibility,” Andrew said. A simple February 14, 2014 Facebook post resulted in a community gathering. Behold the power of social media and engagement. There is power in words. I know this from many years in the field as a journalist. I also know that with a boost from social media, word power morphs and magnifies, and extends to places we can’t predict. Today, allow me to testify about how one person can make a difference simply by putting thought into words and words into action, through social media, powered by a strong sense that others want and need to connect to make the world a better place. On February 14, 2014 I read an article on my hometown newspaper’s website about a community screening in Pennsylvania of a documentary about addiction, and hope in long-term recovery. I immediately shared a link to the movie, “The Anonymous People,” on my Facebook page and wished someone would bring the movie to New Hampshire. One influential friend and 10 days later, a date was set for a public screening in New Hampshire. 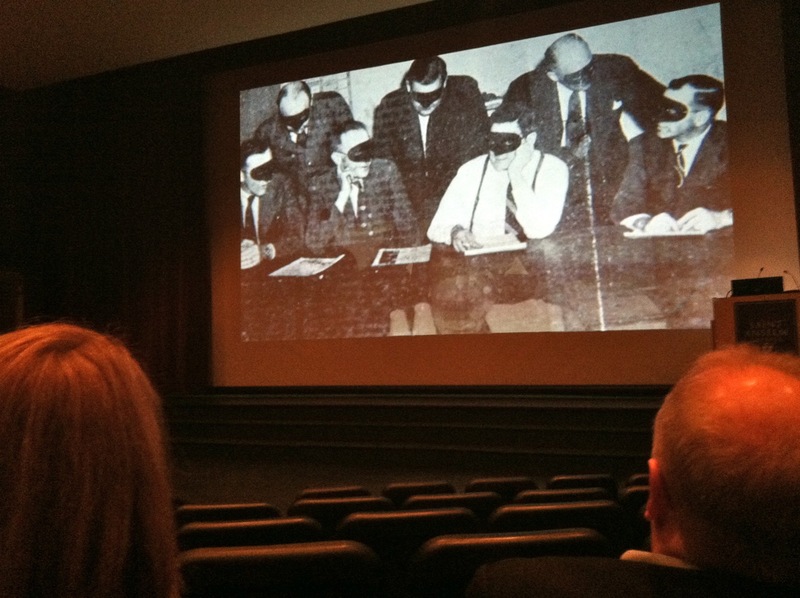 On April 2, 2014 I was seated among 100+ movie-goers at the Dana Center on the Saint Anselm College campus for a free public screening of the movie, followed by a panel discussion. Among those in attendance: Students, physicians, policy makers, professors, priests, community organizers, recovering addicts and alcoholics, family members with loved ones currently battling addiction and in desperate need of meaningful treatment options –which are few and far between in New Hampshire. That was at the heart of bringing this movie to New Hampshire, the need for change. There is a national drug addiction phenomenon featuring heroin and oxycodone currently driving a human health crisis of epidemic proportions. This is not an exaggeration. From our state health officials here in New Hampshire to the U.S. Attorney General, the cost to society in human suffering, crime, law enforcement and incarceration, is exploding. Missing from the equation: Effective resources focused on recovery from addiction. New Hampshire ranks 49th of the 50 states in recovery programs. The only place harder to find treatment is Texas, according to Cheryl Wilkie, Senior Vice President of the Farnum Center and Webster Place Recovery. I guess even the drug problems are bigger in Texas. Public perception drives policy: Headlines about the daily horrors of addiction and celebrities stuck in or lost to addiction drive our sense of hopelessness. “This is our black plague” – a quote from actress Kristen Johnston, a recovering addict who is one of the many celebrities telling their success stories. Lack of systemic support: Those in recovery from cancer are immersed in free post-treatment services “as part of their recovery.” Addicts get five days of detox or 28 days in a rehab bed, if they are among the lucky ones who have insurance or have good timing. After that, they are on their own. 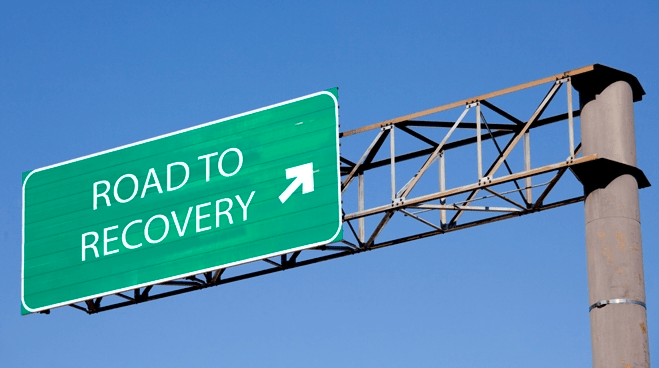 12-Step recovery peer-based programs work: Because they offer immediate support with a proven track record – there are some 23 million people currently living in long-term recovery through participation in Alcoholics Anonymous and Narcotics Anonymous programs. Mental Health Parity Act of 2008 excludes addiction: We continue to view addiction as a shame-based disease. U.S. insurance companies provide a fraction of resources for what is a paralyzing and pervasive human health crises in America. Community is the backbone of recovery: For an addict, recovery is initiated in treatment centers. But they recover in our communities – provided there are resources available to support them in their sobriety. Silence = Death: Borrowed from the early AIDS political advocacy movement and Act Up, actress Kristen Johnston cites “Silence = Death” as the best slogan to describe the urgency of addressing this public health crisis here and now. 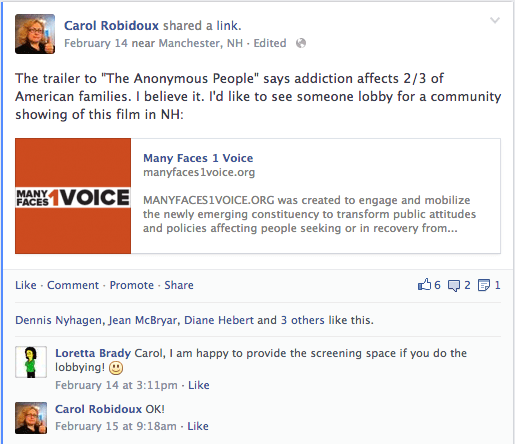 I went back to Facebook after the screening and created a community page: Empowering Addiction Recovery in NH. Please join. It was my initial reaction to keep the momentum going and give people a place to discuss how to move forward, again harnessing the power of social media. I have heard there were some in attendance interested in bringing a public screening of “The Anonymous People” to their city or town. Anyone can do that. Here is a link for more information at ManyFaces1Voice.org. Contact your mayor, board of aldermen, town councilors, town administrators, public health officials, state reps, senators and congressmen. Demand that they address the need for treatment and recovery programs and funding. Ask how you can help. 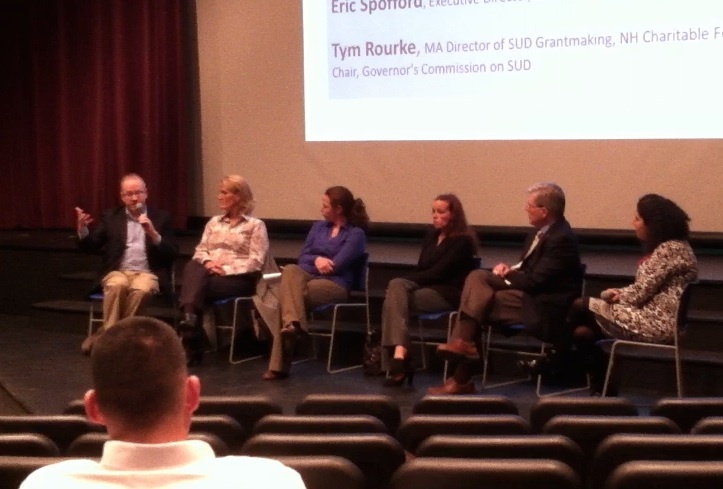 Beyond that, you can reach out to the panelists and experts who supported the April 2 Saint Anselm event, and find out how you can join the conversation and make a difference here in New Hampshire. View this VIDEO: Excerpt from “The Anonymous People” April 2 screening and panel discussion at Saint Anselm, via YouTube. After years in the news trenches, I’m ready to launch Robidoux Ink Link, a solo venture into freelance content delivery. I have been reading a lot about trends in digital content creation and starting up a solo business, and read with particular interest, “The Six Mistakes of New Ventures,” on Practical Decisions, an entrepreneurial think tank of sorts. Mistake No. 1 is “Passion Without a Plan.” Passion is my strong suit. As for a plan, I’m excited to be working with New Hampshire’s innovative Pathway to Work program, which will help me develop a business plan and get things up and running. I am also in the good hands of Lee Hecht Harrison in Manchester, a parting gift from Patch.com, which has provided me with invaluable resources. Mistake No 2 is “Selling Too Cheaply.” Hey, tell me about it. As a longtime journalist in a shrinking industry for which no news entity seems interested in paying a living wage to highly trained professionals, I know well the hazard of working for peanuts. My sales pitch as a freelance digital content creator underscores my experience and effective way with words. I like to say I’m “worth my weight in gold” (although these days I might do better to say I’m worth my weight in bitcoin.) And I’m counting on my prospective clients to agree. Mistake No. 3 is “Ineffective Marketing and Advertising.” If nobody knows who you are or what you can do, how will they find you? 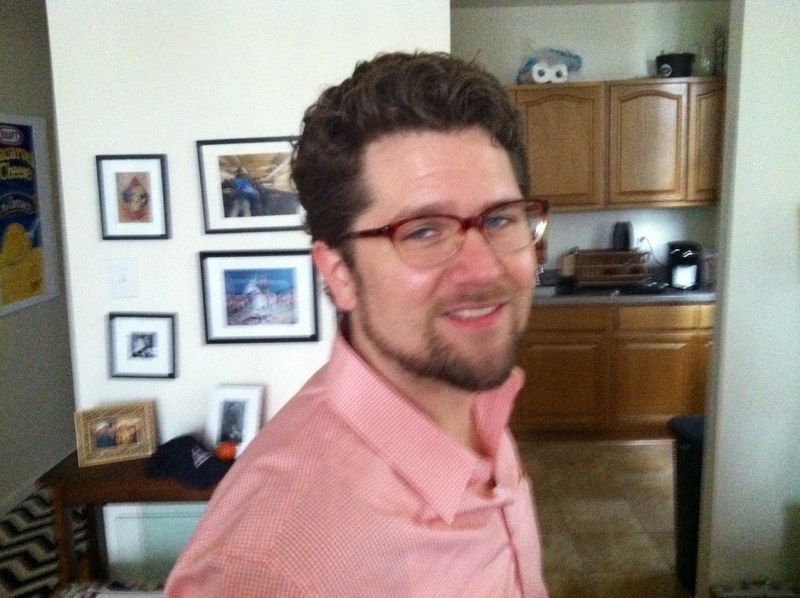 So, you will begin to see me popping up everywhere, from Facebook and Twitter to public events, and business mixers. I’d love to talk to your group or organization about what it means to be a 21st century media maven. Please share my links, give me feedback, reTweet me often. If you’ve been on the receiving end of my services or storytelling, I’d appreciate an endorsement to include here on my website. You can email me at robidouxink@gmail.com. Mistake #4 is “Underestimating Capital,” and gets into knowing how you will sustain yourself until you break even, while maintaining a creative financing plan. As a longtime human being, I feel sustaining myself in creative financial ways is the sole reason why I’m still standing. Fortunately for me, in this particular venture, I don’t need a storefront. There’s no inventory I need to invest in upfront. It’s just me, doing what I do, from the inside out. Mistake No. 5 is “Lack of Management Oversight.” You can take this to the bank: I plan to be the best boss I’ve ever had (no offense intended to all my previous bosses, who were all wonderful, by the way). Mistake #6 is “Lack of Specific Skills:” They saved the best for last, in my estimation. 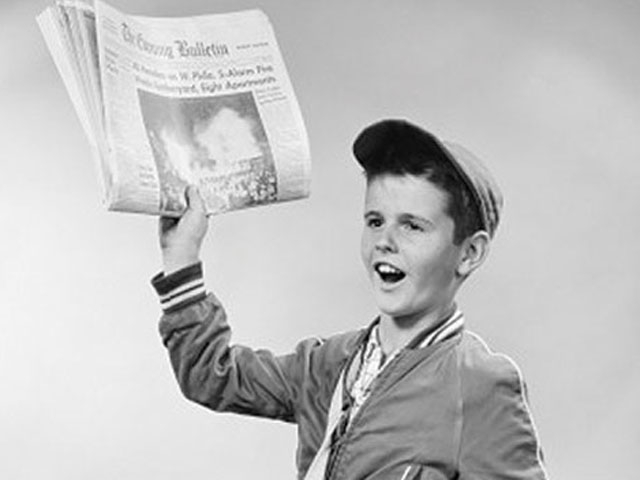 Because Robidoux Ink Link will finally give me the chance to fluff my feathers and spread my wings as a skilled journalist, storyteller, content creator and professional writer. And fortunately for me, I am also an enthusiastic networker, diligent Tweeter and Facebook fiend, I love meeting new people, and pitching ideas. Of course, there is one more important point: We all make mistakes, at least six of them in a life time. Especially writers and journalists and editors, who know that this is a daily hazard of the human condition. We’ve got the “next-day correction” archives to prove it. I firmly believe that if you’re out there not making mistakes, it’s because you’re not doing anything. Today, I am ready to fly.